A Most Magnificent Natural Area, Shared as an International Peace Park and World Heritage Site by the Great Countries of Canada and the United States. 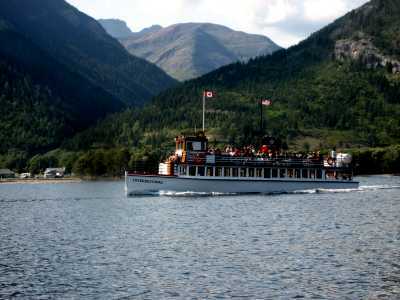 Launch:--The town of Waterton lies wholly within the Park. 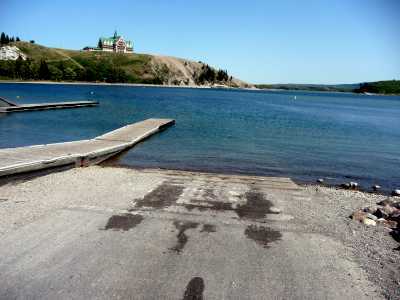 The site of the scenic cruise boat shuttle, at the northeast end of town, is the location of the Park marina and launch ramp. The ramp has a dock and is relatively easy to use. Park on the main street, Mt. View Road, to the southwest of the ramp. 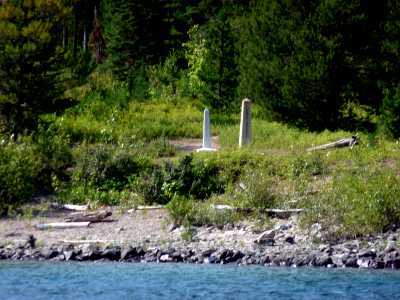 Nearby campsites: --There is a fine National Park campsite at the south end of town. 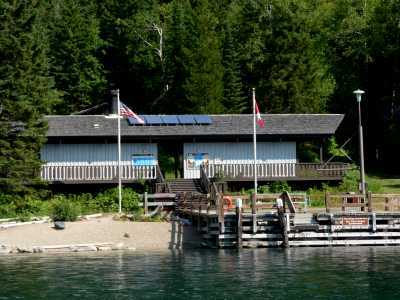 Electric pull-through sites are available; there are free showers; and the waterfront view at sundown is impressive. Follow Windflower Road southerly and it leads to the entrance. Wild deer graze like sheep in the camp. 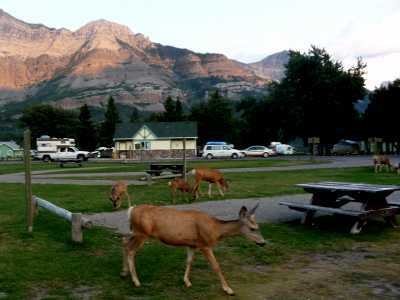 Comments: --Waterton is a pretty tourist town. 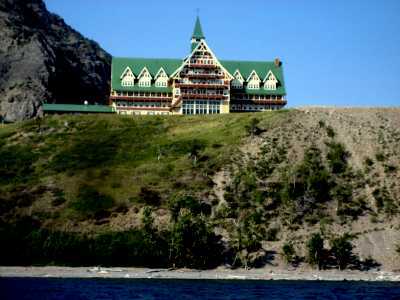 The Prince of Wales Hotel lies on a ridge at the south end of the Waterton Lakes and has a most impressive view. Here the prairie meets the mountain. CC"It's only a few miles farther north than Saint Mary Lake - we're close - let's go," El likes to 'push the envelope' a bit. We had pulled from salt water in the San Juan Islands and were heading down to Lake Powell several weeks ago, when I had suggested taking the route to the left and exploring some of northern Montana's lake country. We chatted about it at a rest stop on the freeway, and decided to take the road, "the one less travelled by," and it DID make a big difference. We have now cruised Flathead Lake, Broken Horse Reservoir, and Saint Mary Lake, and now there's another divergence of road. 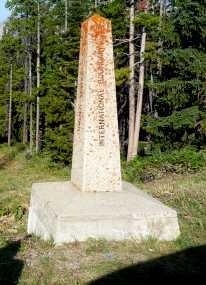 This time, turning left, would cross the international border. 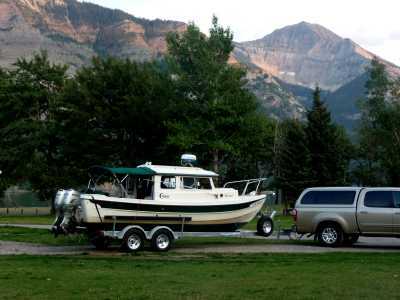 CC"We have our passports, and Brad and the grandkids have just been up there hiking and loved it," El smiled as she packed up the boat cabin for travel. CC"Last time we were there," I said with a frown, "it was a huge storm. Remember? Lashing cold rain, fierce winds that almost blew us (literally) off the road. And there's a big frontal system moving easterly across Washington as we speak. The lake would be a mass of froth, with the winds funneled between the high ranges - just like last time." Remember, I'm the worrywart of this duo. CC"If we go now, we can be there in a few hours, and beat the front. Then, snuggled in the boat at the campground, let it rain." 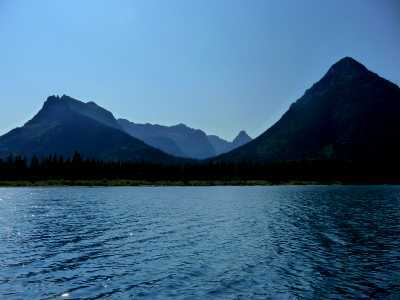 CCWe had launched that morning into Saint Mary Lake in Glacier National Park and had an incredible cruise into the lair of the lofty Rockies on a mirror-reflecting surface. The day had begun with sighting a Black Bear in a berry patch. "A good omen," El had said, and she was right. 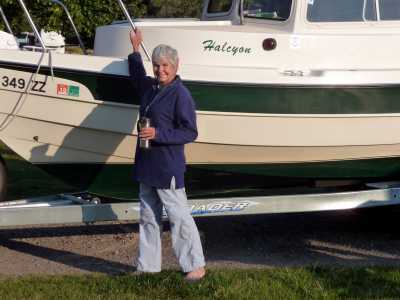 Now, midday, the air was still stable and the sun bright and we pulled Halcyon out of the Saint Mary Lake. CC"We're biting off a bunch in one day, Hon," thinking of two launches into high mountain lakes. But, then the thought struck me - "Oh! (if) I kept the first for another day ... knowing how way leads on to way,I doubted if I should ever come back." I remember as a young college kid sitting in front of a snug winter fire in New Hampshire with friends, and a grizzled old man, with a husky voice, saying those words to us - Robert Frost. He has been a guiding light for me ever since - and he's right. Take the opportunity when it presents itself, you may never come back. CC"We're outta here, kid," I said, helping put things away. A few hours later, in another country, we were sliding down the launch ramp into Upper Waterton Lake. CCIn 1872, Yellowstone became the world's first national park. The idea became immensely popular. 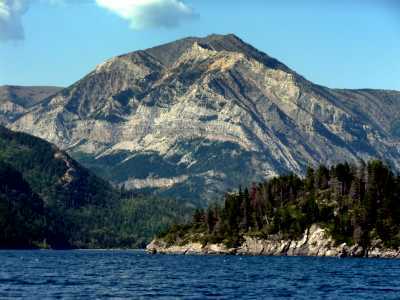 In 1895, Canada's Minister of Interior established Waterton Lakes National Park and added the simple (and proven oh so true) comment, "Posterity will bless us." 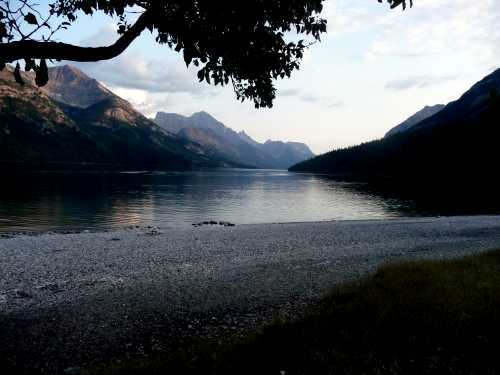 In 1932, Canada and the United States, recognizing that the joint boundary between Glacier and Waterton Lakes constituted a single ecosystem, joined the parks into an international park - celebrating our years as peaceful neighbors, it was declared an International Peace Park. CCMy personal family had done the same thing some years earlier - when my US-born grandfather married my Canada-born grandmother. Being a quarter Canadian has been a happy experience for me, since early childhood many of my travels have been in Canada and I have felt a sense of belonging. 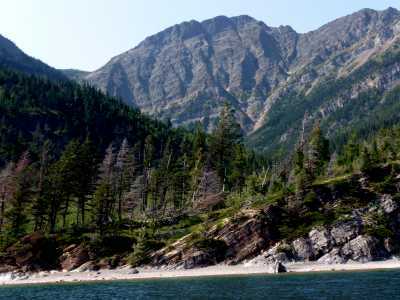 CCThis is the common meeting ground of the prairie and the mountain - wind-wept grasslands and old-growth forests - present-day glaciers and deep lakes, whose basins were scoured by ice. George Grinnell, founder of the Audubon Society, called this place the "Crown of the Continent." A single drop of rain, by chance landing an inch in any direction, can at one place flow either to the Gulf Coast and the Atlantic Ocean, or the Pacific, or into a drainage that flows to Hudson Bay. The diversity of environments means a diversity in plant and animal species - one of the most varied anywhere in the Rocky Mountains - a paradise for biologists (as well as grizzly bears and wolves). CCGlaciers and streams erode valleys in distinctly different ways. Ice, flowing down a valley, scrapes the sides of the valley as well as the bottom - this results in a characteristic U-shape to the valley. CCThe energy and eroding force of a stream is directed below the flowing water - little scour occurs along the valley sides. Hence, river-carving results in a V-shape to the valley. CCNow, for the exam. You know the distinction between U-shaped valleys (glaciers) and V-shaped valleys (streams). OK, how about this one - what caused this? CCSure, glacier-scoured above and stream-carved below. 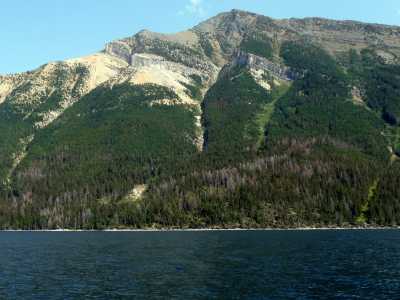 But, why didn't the glacier scour all the way down to the valley now occupied by Waterton lake? CCOne good explanation is that the Waterton Lake Valley was filled with it's own glacier - the one that scoured out the (now) lake bed. Ahah! So the tributary glacier that scoured the valley we see flowed into and joined the ice of Waterton Valley. When glaciers join, they don't have to have their valley bottoms at the same elevation. Stream valleys do, or their is a waterfall at the junction. 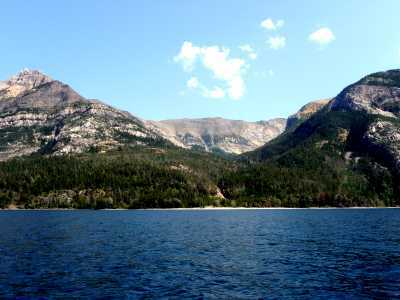 So, in this view, the upper valley was occupied by a glacier that joined the one in Waterton Valley. It is a 'hanging valley' since the side valley didn't join the main valley 'at grade' - with their bottoms scoured to the same elevation - it 'hangs.' 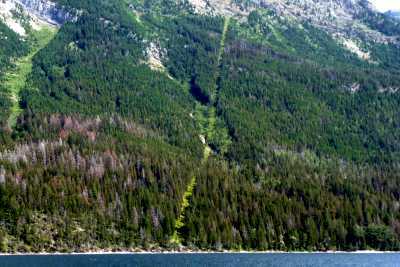 Later, after the glaciers melted from both valleys, a stream carved the characteristic V-shaped valley and joined the Waterton Valley 'at grade. CCSome of the oldest sedimentary rocks on Earth are found in the park - the Belt Series. These rocks are described in our discussion of Hungry Horse Reservoir, where they also outcrop. 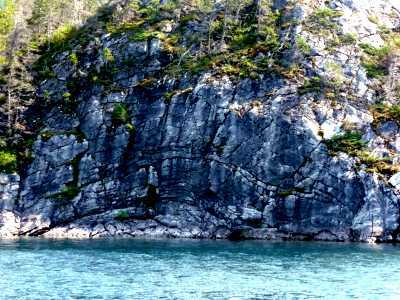 Here the tough old rocks have been shaped and scoured by glaciers creating awe-inspiring scenery and natural beauty. 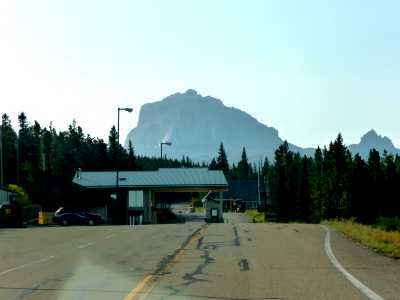 CCThe rocks have also suffered bending and faulting due to the collision of the plates that created the Rockies, as discussed in Hungry Horse. 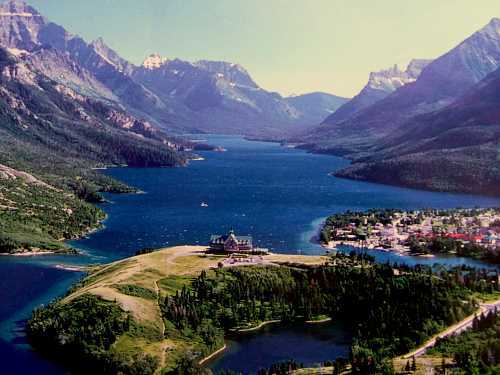 CCThe US-Canada border divides Waterton Lake. At the southern end, there is a US customs station that must be cleared by those who intend to hike on the US side of the border. Boaters, however, if they don't disembark or meet other vessels below the border, are allowed an unrestricted passage. CCCamping is easy at the town park, with many sites large enough for the boat and trailer. You can walk to the town or the lakeshore easily from camp. 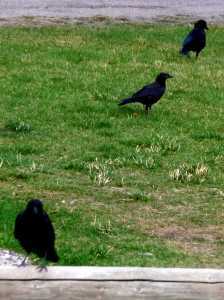 And there are many visitors - two-footed and four. CCBut, the best part of the cruise, is enjoying the simple beauty of the surroundings. Understanding the reasons for what we see adds a deeper dimension but should never be allowed to block the glory of the vision.